From the U.S.’ foundation when slavery was a hot debate to the 1960s when African-Americans fought for the equal opportunity they were supposed to have already been granted, racial equality has been an issue in America. Starting in 1961, the federal government has been trying to correct past inequalities through affirmative action policies that mandate racial diversity into workplaces and schools. 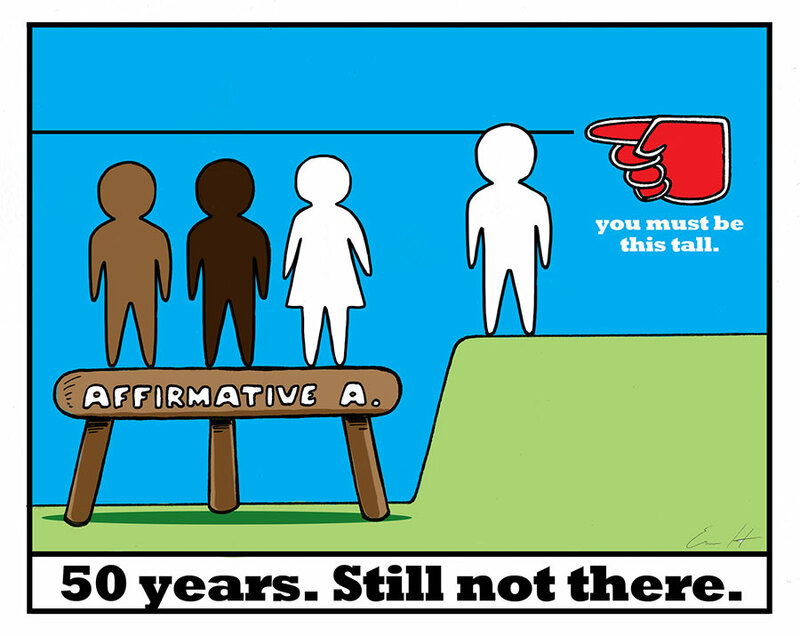 Affirmative action has been a center of controversy for most of its existence. Proponents say the policies make up for social and economic inequalities that reach back to slavery while detractors say the policies essentially fight fire with fire by forcing schools and employers to discriminate against a different race instead of ending discrimination altogether. In some cases, affirmative action can lead to minority persons getting jobs or school seats over more qualified Caucasians. One undergraduate, for instance, is suing the University of Texas at Austin over not being admitted in 2008. The plaintiff graduated high school with a 3.59 GPA and scored an 1180 on her SATs. She is white and believes her chances were hurt because of her race. The case is currently before the Supreme Court. Fifty years after the civil rights movement and 150 years after slavery was ended, aren’t we past all this? No one is naive enough to think racism is gone entirely, but is it still at a level that the federal government has to try and mandate it out of existence? According to a 2009 Census report, 28 percent of Americans above 25 had a bachelor’s degree, but if that pool is narrowed to African-Americans and Hispanics, the number drops to 17 and 13 percent, respectively. In October, according to the Labor Department, unemployment rates were 7 percent for whites, 14.3 percent for blacks and 10 percent for Hispanics. 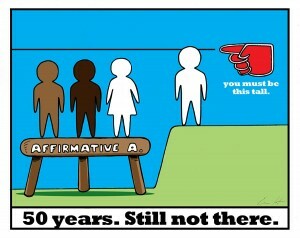 Fifty years after affirmative action was implemented, America still has inequality. Race-based policies, like TCC’s new minority mentorship program, are still necessary because, according to TCC administrators, half of African-American and Hispanic students drop out after their first semester. Knowing the college is paying special attention to minorities is annoying to some people, but the district had to do something. It would be even more annoying if the college broadened the mentorship program to demographics that aren’t struggling. Affirmative action hasn’t led to total equality, and at this point, it probably isn’t going to. The government would help a lot more by making it easier to break the poverty cycle by allowing poor children of any ethnicity to get a better education and win those school and work slots on even terms. Those are long-term projects. In the interim, nobody can say TCC is wrong to try and help minorities a little sooner.